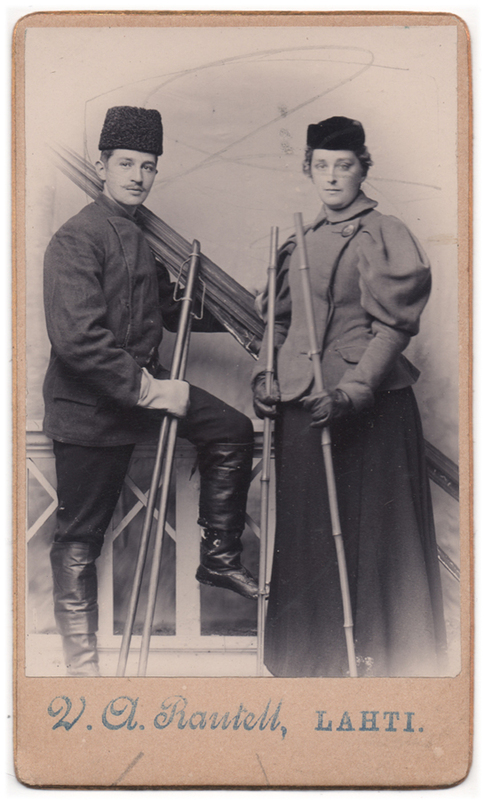 Photograph of an outdoorsy couple posing with skis in a studio setting. Both are dressed in winter clothes, including gloves, hats and coats. Someone has slightly smutched the picture with a pencil, leaving hasty strokes across the faces of the people portrayed; the woman’s face is a bit more blurry than the rest of the photograph, but her serene expression is clearly visible, while the man has directed his gaze slightly off-camera to his right, with a hint of a smile across his face. I have no doubt the couple pictured here genuinely enjoyed skiing (although I can’t help thinking that it must have been somewhat difficult for her to ski while wearing that long skirt). The picture has been taken by V.A. Rautell in Lahti, Finland, most likely during the late 1890’s or early 1900’s.